Recombinant fragment, corresponding to a region within internal sequence amino acids 86-323 of Human CHST7 (Uniprot ID: Q9NS84). NT2D1, IMR32, U87-MG and MCF7 whole cell lysate. MCF7 cells. Human hepatoma tissue. Our Abpromise guarantee covers the use of ab154726 in the following tested applications. WB 1/500 - 1/3000. Predicted molecular weight: 54 kDa. CHST7 belongs to the sulfotransferase family. Sulfotransferases generate sulfated glycosaminoglycan (GAG) moities during chondroitin sulfate biosynthesis. They create considerable structural diversity among chondroitin sulfates by transferring sulfate with remarkable specificity for the underlying oligosaccharide substrate. 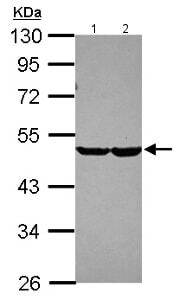 This protein mainly transfers sulfate to N-acetylgalactosamine. The regulated expression of each member of the family may be an important determinant of sulfated GAGs expression and the associated function of chondroitin sulfates as regulators of many biologic processes. 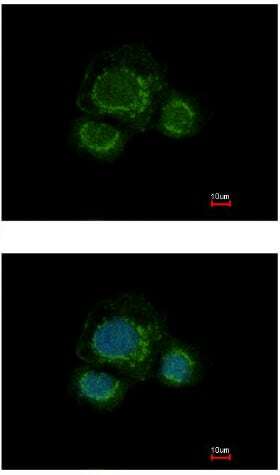 Immunofluorescent analysis of methanol-fixed MCF7 cells labeling CHST7 with ab154726 at 1/500 dilution. Lower panel co-stained with Hoechst 33342. 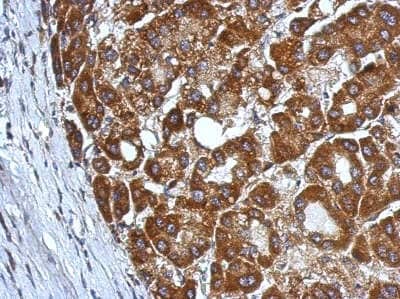 Immunohistochemical analysis of paraffin-embedded Human hepatoma tissue labeling CHST7 with ab154726 at 1/500 dilution. ab154726 has not yet been referenced specifically in any publications. Publishing research using ab154726? Please let us know so that we can cite the reference in this datasheet. There are currently no Customer reviews or Questions for ab154726.